Donna Britton Bukevicz | Oscar-Contending vocalist, Singer-Songwriter | What does Music as Message, LLC. do? I am proud to be a partner with Music as Message, LLC., creating original songs and multi-media content to help teach children to care and take action to Think Ecologically®. We call it Eco-edutainment. We are devoted to the well being of children living in a world where kids of all ages Think Ecologically®. Our family friendly music & arts environmental education programs combine education and entertainment to foster stewardship behaviors toward the environment, to promote community action and enhance learning through the arts. Our programs enhance the ecological programs of our partnering organizations through ARTS. Simply put, we add the “A” to STEM! Meet the Partners & Creative Team from Music as Message, LLC. 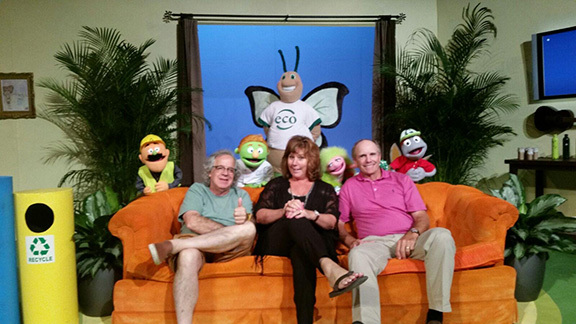 (front row-left to right) Ross Orenstein, Donna Britton Bukevicz & Jerry Pate (back row left to right) Mr. Recycle Man, Chef Green Daisy & Little Buddy – Eco the Butterfly. All intellectual property is owned exclusively by Music as Message, LLC., a Florida Corporation. Any use of this content without permission is a violation of Federal Trademark laws.